Name the book which records an inter-church theological conference. There are over 200 listed phobias ranging from acerbophobia (fear of sourness) to xenophobia (tear of strangers). While some may view these fears as a laughing matter, phobia sufferers know just how seriously they can disrupt one's life. But there are ways of coping. 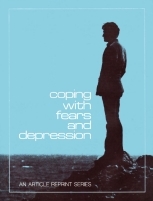 Fifteen percent of all Americans aged 18 to 74 suffer symptoms of serious depression. Depression has been called the "common cold" of mental illness, and some have even gone so far as to label it the "social disease of the seventies." Here's how you can take steps to avoid experiencing this debilitating condition. Suicide is a universal problem - it can strike anywhere. Below are the grim statistics from around the world. Do you have doubts about holding your job? Do you worry over loss of money - or over the lack of money you need? Does the dread of illness or of a nervous breakdown or of insanity haunt you? Are broken friendships, repressed love affairs robbing you of health? Then here's what you need to do! Please click the above PDF icon(s) to view or download the full Booklet (Special Topic) in PDF format.